We all love to design our home to fit our style and be our little personal haven that both represents our personalities and has us feeling at ease. One of the most important aspects to making your house a home is picking out the right design elements to set-up your house exactly as you pictured it in your mind. What you do to your walls happens to be one of the most important design decisions when it comes to the interior design of your bedrooms, living rooms, bathroom and even the kitchen. Pick the wrong wall color or pattern, and you will find yourself uncomfortable in the room. On the other hand, make the right decision and watch how every design decision afterwards can match up to the wall, piece by piece. 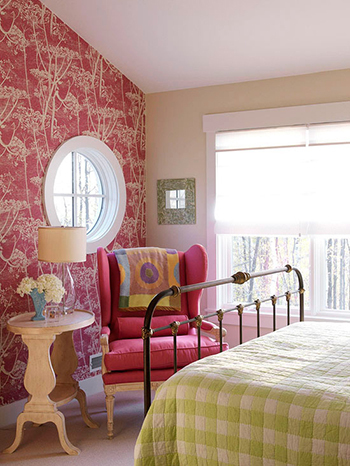 With that in mind, here are a few creative ideas on how you can use wallpaper in your home! Nothing is more striking in a room than a gorgeous feature wall. Rather than use your wallpaper on every wall, place your favorite wallpaper pattern on a single wall, preferably the wall directly opposite the door. Then, ensure it’s a focal point by using complementary color on the remaining walls – either a solid paint color or solid, pattern-less wallpaper. The approach is especially effective when using a bright, bold pattern and matching it to a softer, calmer color for the other walls. An overview of Graham & Bell Wallpaper shows some great bold pattern designs that would look perfect on a featured wall. Instead of using only one wallpaper, go wild and pick out an assortment. You can cut them into squares or other shapes and place them one next to each other, making sure to fully cover the wall and not leaving any blank spaces between the pieces. It’s a fun way to add some variety of shapes, colors and patterns to the wall. 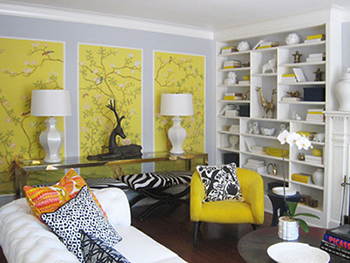 Be smart about the color or pattern choices: go too wild or varied and you will create a dizzying wall. It’s preferable to use a particular color palette (for example, blues and greys make for a great combination), or stick to one pattern in different colored wallpaper. When wallpaper is hung, it’s usually hung vertically, piece by piece. Think outside the box and do things differently – hang them up horizontally! This will create a completely different look (depending of course, on what pattern you pick). It’s especially neat with wallpaper that has a striped design meant to reach from the floor to the ceiling. Instead, the lined design will move horizontally through the room, creating an attracting division to your wall. Don’t forget about the ceiling! Ceilings are often left blank… well, if creativity and impact is what you’re looking for, don’t follow the pattern! Use wallpaper on the ceiling much like you did on the walls. You have a few options in terms of colors and pattern, but it can look very nice to use the same wallpaper as the walls. Alternatively, you can use the same wallpaper pattern in a different color. It looks very chic! Sure, you could use wallpaper to cover the entire walls, from bottom to top. But how about taking a more creative approach and using framed wallpaper panels instead? The look creates an interesting aesthetic on the walls, causing a natural balance and order in the room. It’s an eye-catching background that works with furniture and it’s sure to cause an impression. Additionally, it’s a great way to save money by using less wallpaper, without the need to give up on the wallpaper pattern you fell in love with. Creating the panels is easy enough: cut the wallpaper to panels of desired length, find a very large photo frame or have the wallpaper framed professionally, and then hang them up.